Due to an increase in DUI related accidents in recent years, the California legislature has passed increasingly strict DUI laws. Regardless of whether or not the individual is a first time DUI offender, he or she is subject to a variety of harsh legal consequences if convicted. In cases where an individual caused an accident while driving under the influence of alcohol or drugs, that person may be arraigned on a heightened charge or may face penalty enhancements upon sentencing. 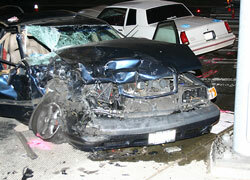 The legal penalties associated with DUI accidents are severe. If an individual is convicted of causing an accident while driving under the influence of alcohol or drugs, he or she may be subject to a variety of penalties including imprisonment, probation, monetary fines, community services, DUI School, vehicle impoundment, and driver’s license suspension. In addition, individuals convicted of causing an accident while driving under the influence will receive a negative mark on their criminal record which can affect an individual’s future housing, employment, and educational opportunities. If you have been involved in an accident while driving and the police claim you were under the influence, it is in your best interest to consult with a knowledgeable California DUI defense lawyer who specializes in DUI accidents at once.